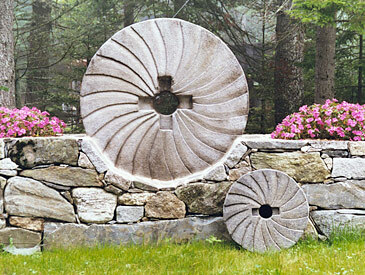 We are the last producers of authentic, hand-carved granite millstones in the USA. Since the majority of the millstones we sell are used in the landscape industry, and since most customers want a millstone that looks old, we have developed a method for antiquing our stones. The result is a millstone that fits the site requirements, looks historic, and adds charm to the landscape, whether used in a patio or walkway, as tables, fountains, doorsteps or focal points. We also have a collection of historic millstones and would be happy to discuss their appropriateness or adaptability for your application. 1/2 millstone, 7" thick, from 3 to 8 feet in length. These bring a sense of history right to your entryway. Allow 10 days for delivery. We usually have several historic millstones available. They are more expensive and adaptability to your project may be difficult due to limited variety and size. Please call for more information.